This is a great well-rounded mix of historical adventure, Lovecraftian horror, non-sappy romance, and enough explosions to keep Ace happy. Mel has just rejoined the Doctor and Ace, which means that like later Peri and older!Nyssa, she’s run past the end of her TV continuity and could, in fact, meet a grisly end. This time out, her old friends are trying to treat her to the best of time and space, so of course their Spanish vacation lands in the middle of the 1930s Civil War. At least there’s no androgums. Mel: Well, this is a lovely holiday so far. Ace: With the Doctor? I’ve had worse. Mel: You know what. So have I. We must need our heads examin[ed]. They fall in with the losing side, which means the Doctor faces something of a dilemma about how much to help them. If that weren’t enough of a headache, there’s mutant monsters and a leper colony whose unlucky inhabitants are treated as monsters by the local population. All of which present some interesting themes and ethical subtexts beneath a lively mix of adventure, excitement, well-drawn secondary characters, moments of courage and good character beats, historical flavour, a Spanish ambiance. All these ingredients greatly enrich a standard find-and-defeat-the-monster plot. But who is the monster? Soldiers? Lepers? Villagers? Aliens? The walking dead? The Doctor? The answer to that question includes a juicy surprise, proving once again that audio is sometimes the ideal Doctor Who medium. The regulars are in great form in this audio, with some delightful character bonding between Ace and Mel at the beginning and end before they inevitably get separated into parallel plot threads. English war journalist George Newman tags at Ace’s heels like a puppy, yet manages to be likable. Juan Romero, presumably named for a character in an obscure Lovecraft story, is a grim yet personable soldier, an unusual and fascinating foil for Mel. The Doctor dashes back and forth between his two companions on too-short legs, unsuccessfully trying to keep them out of trouble while tracking down the hidden danger. By the end, nearly every speaking character has played a vital part in saving the day, an impressive feat of narrative juggling. My favourite parts of this story were Mel’s interactions with the rebel leader Romero. She’s matured since the old days, no longer perky, but shrewd, caring and self-sufficient in a way that’s a down-to-earth blend of idealism and pragmatism. A lot of it is conveyed through simple offhand moments like Romero telling her to “wait here!” and Mel saying “fat chance” before charging after him. Also, the ambiance of the Spanish countryside in wartime, conveyed by a regional-style soundtrack and the intrusive buzz of insects in the background, lends this entire story a unique tone. This audio does a better job than the last of bridging Ace and the Seventh Doctor, post-Hex, with a Mel who’s also grown and changed while she was away. There’s still an uneasy tension between EU Seven and Season 24 Seven. He’s more the playful clown I remember fondly from Delta and the Bannermen, pulling whimsical objects out of his pockets and wearing his heart on his sleeve. But the audio subtly questions whether that’s the real Doctor, or whether he’s a darker figure beneath the surface. It’s as if this audio is trying to have it both ways. Similarly, this belligerent Ace is halfway between the youthful thrillseeker of Dragonfire and the seasoned special ops agent in stories like The Harvest. It’s as if Mel’s mellowing influence has caused both of them to regress. I wonder if Big Finish is trying to walk back chessmaster Doctor and space marine Ace a step or two, much in the way it walked back some of the changes in Eight and Charley in the Divergent Universe. Because of that slight character retconning, the one-dimensional monsters, and the fact that I predicted the deus ex machina that would solve the endgame crisis before the Part One cliffhanger, I was going to rate this audio 7. 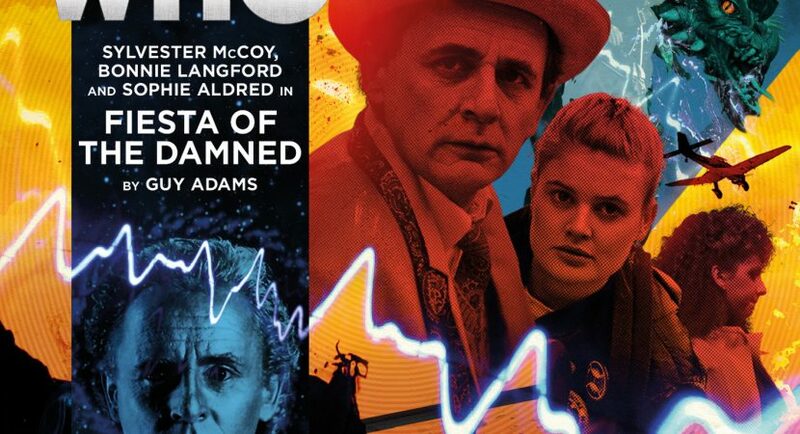 That is, a solid classic Who serial we would’ve enjoyed on TV in the 80s, but not one of Big Finish’s exceptional stories. However, everything came together so well that I’ve waffled back and forth and settled on an 8. Most of all, I’m delighted to watch hear this TARDIS team develop beyond what we saw on TV. Addendum: I tend to forget that some fans don’t or didn’t like Mel. Fiesta of the Damned demonstrates once again why I think you’re missing out. Yawn. Sorry, folks; she’s flirting with Johnny One-Note guys again. I may have given away too much in this review, but a few more things. I loved the way Ace’s “Don’t worry, I hid the spoons” neatly bridges early and later Seven for Ace and Mel. I love the way Mel and Ace commiserate with one another about the Doctor’s frustrating habits. It’s very rare to have two female TARDIS team members, and I’m still waiting for Big Finish to capture the dynamic of women working together. There’s some moments of it in this audio that promise more.